0860-0004 : 2 volt 4.5Ah Sealed Lead rechargeable battery. Dimensions: 4" long, 1 3/8" diameter. Limited quantity available. 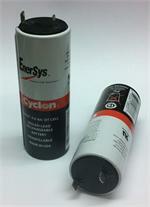 0810-0004: 2.0 volt 2.5 Amp-hour Sealed Lead rechargeable battery. Similar in size to a "D" battery. Has (+) and (-) Lug connectors on top. 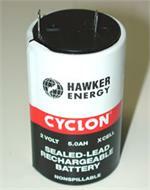 0800-0004: 2 volt 5Ah cylindrical Sealed Lead rechargeable battery. 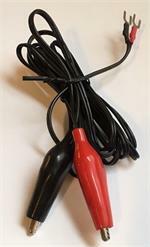 Rating: 2.0 volts, 5Ah capacity. Size: 2.9" tall x 1.75" diameter. Has (+) and (-) Lug terminals on top. Weighs just under 1 pound. 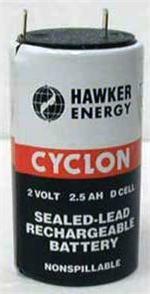 Cyclon brand 2 volt 4.5 Amp hour sealed lead rechargeable battery. Cylindrical, with lugs on top. Size: 1 3/8" diameter x 4" tall.